Saul Alinsky was a U.S. citizen who died at 63 years of age. He became known throughout his adult life for the embodiement of the term, "Community Organizer," and for his book, "Rules for Radicals." Throughout most of his adult life, Saul Alinsky was on a mission. He wanted to see the complete transformation of America into a socialist state. He studued other socialist movements and their successes and failures in an effort to devise a way to successfully bring this radical socialist transformation to America and to apply what he considered to be "social justice," to American society. He devised oranizations to work in a grassroots fashion to spread his ideas and indoctrinate, recruit, and then organize these people to further advance his cause. This is where the term "community organizer," came from. What he learned, he documented in his book, and taught to others. Many of today's socialists, progressives, and those with strong marxist leanings in the United States view him as something of an oracle, because of his methodologies to bring prgressive, far left ideas to fruition within America. 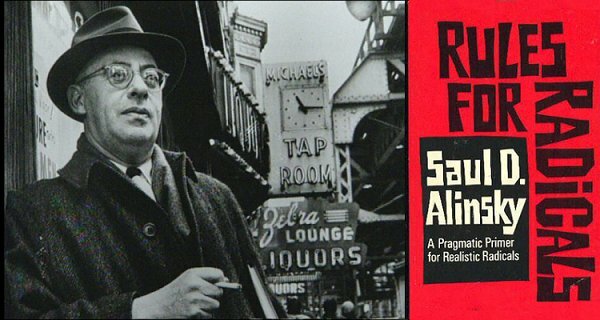 Saul Alinsky taught about eight principle areas of interest to target in transforming American society, all of which would be necessary if the goals for progressive, radical, social justice could be accomplished within the United States according to his "Rules for Radicals," which were to be used to attain success in these targeted areas. It is critical for patriotic and concerned Americans to undertsand what these targeted areas are so that the can recogniza and combat them, and guard against their indoctrination, implimentation, and against the ultimate downfall fo traditional America as a Constitutional Republic. Listed below are the eight goal areas. Ask yourself, as you read about them, how they are being applied in today's society. I believe you will be familiar with them all. Healthcare - Obtain as much control as possible...complete control if possible...of the health care system of the United States. With that control, the entire society and its people can be manipulated towards the goals of the social justice imperative. Poverty - Increase the percentage of people living at a poverty level within the United States. As this occures, programs must be be implemented to address this poverty and drain resource from the more productive segments of society. Do it in the name of social justice. Those recources can then be used to fund programs and initiatives that further intrap not only the impoverished, but also increase their numbers, thereby increasing control over a larger and larger segment of society. Debt - Increase the overall debt within society, both at the national and the individual level. Seek to increase it to an unsustainable level, so that increased taxes and other governmental initiatives to help save society become an imperative. This will serve to produce more poverty and decrease societal capabilities to throw off both the poverty and the debt. Gun Control - Remove the ability of individual citizens in any appreciable numbers to own and use firearms. This must be taught to be an antiquated, by-gone principle that is no longer required in a modern society and which presents a danger to peaceful citizens. Emphazise every concievable occurrance which can be used to reinforce this premise, and play down any occurance that would detract from it. Build up a fevered opposition to firearm ownership and use and use this "movement" to elect individuals in agreement with the need to first limit, then regulate, then register, and ultimately to ban firearms from private citizen use. Use community organizing principles in creating the imperative for this amongst the populace. Welfare - Define welfare as something which larger and larger segments of society fall into so that more and more programs can be implemented to establish social equality, taking from those who produce and giving to those who do not in order to obtain this social equality, while wresting control of the resources from individual people and companies and placing it in the hands of the state, who must the people must be taught to be far better equipped to establish the social equity and social justice imperatives. Education - Establish control of education in the hands of those who undertsand and implement the social justice and social equity principles. Ensure that these groups are liberally and equally spread amongst governmental entities, worker (union) entities, and community organizing entities throughout society. Seek to defeat any initiative that would impair these progressive goals, be they attempts to privatize education, attempts to allow non-progressive institutions or citizens to use tax structures to choose their own education, or to develop home schooling. Any and all of these counter efforts will slow down the educational initiatives necessary to achieve the social justice and equity necessary to transform the United States. Religion - Establish within the minds of as large a segmnent of the populace as possible a trend towards undertsanding that fervrent faith is fanatical, and antiquated within a modern, progressive society. Ensure that the education system is not allowed to foster or teach such antiquated ideas to the rising generation, or to teach of their history within the United Sates. Replace that history with cultural diversity historical topics. Use separation of Reilgion and Government to enable this, and then do not be deterred from it as the established and entrenched religious organizations within the United States seek to overcome this trend towards modern societal thinking and development. Class Warfare - Ensure that those who become wealthy as individuals, who are not completely dedicated to social justice and social equity, are seen by the populace as having obtained their wealth through unfair and inequitable means, whatever that source may have been. Teach that the so-called "free market," is inheritantly unfair and must be replaced by a more regulated, socially just "fair market," that can be controlled towards social justice and social equity ends. Use the resulting divide to the people and segment into the "wealthy," and the "poor," such that the increasing "poor," or "welfare dependent," segments of society demand that the wealthy give up more and more of their individual wealth to those who will equitably distribute it to society as a while in the establishment of overall social justice. Alinsky then proposed a set of rules that his community organizers could use to accomplish these goals...and they are the rules included in his book, "Rules for Radicals." Rule 1 : Power is not only what you have, but what an opponent thinks you have. If your organization is small, hide your numbers in the dark and raise a din that will make everyone think you have many more people than you do. Rule: Ridicule is man�s most potent weapon. It�s hard to counterattack ridicule, and it infuriates the opposition, which then reacts to your advantage. Rule 9: The threat is more terrifying than the thing itself. When Alinsky leaked word that large numbers of poor people were going to tie up the washrooms of O�Hare Airport, Chicago city authorities quickly agreed to act on a longstanding commitment to a ghetto organization. They imagined the mayhem as thousands of passengers poured off airplanes to discover every washroom occupied. Then they imagined the international embarrassment and the damage to the city�s reputation. Rule 11: Pick the target, freeze it, personalize it, polarize it. Don�t try to attack abstract corporations or bureaucracies. Identify a responsible individual. Ignore attempts to shift or spread the blame. It is clear that although Saul Alinksy did not live to see the fruition of his ideas and programs, that others have taken up his cause and are very near to accomplishing his goals. We now have in the United States, a President in Barack Obama, his entire administration and their supporting democratic party that have all embraced the ideas and goals of Saul Alinksy and are in the late stages of accomlishing them in United States. Our Constitutional Republic, which is based on fundamental moral principle as enshrined in the Judaeo-Christian faith, and by hard work, individual initiative and responnsibility, and a free market that is grounded in the same, is being made over into a socio-marxist state before our eyes. The nation that developed the highest standard of living, fed the nations of the world, and been the strongest force for liberty and the defense of liberty in the history of man, is being turned into a socialst nation. A nation that is less and less able to defend its own intersts, that is more and more dependent on other nations, and that has outsourced its own massive agricultural, energy, manufacturing and production capabilities to those other nations. The United States is rapidly being relegated into a nation that is unable to defend liberty throughout the world from dictators, despots, and communist/marxist powers who masquerade behind so-called social justice and social equity facades like those that Saul Alinksy proposed. Every single nation in history that has embraced these so-called social justice and social equity ideals and the socialism and marxism that is their foundation, has failed. Their down fall has been punctuated by two common characteristics that mark their failure and fall...bankruptcy and genocide. Marx, Lennin, Hitler, Stalin, Mao, Pol Pot, and the list goes on and on, have all been leaders who pushed for, and in many cases achieved, the accomplishment of the goals that Saul Alinksy proscribed...and the world has witnessed wars, atrocities, gargantuan failure and destruction, and genocide as a result. Hundreds of millions of human beings were down trodden, abused, impriosned, enslaved, and slaughtered on the alter to these ideals. No matter how utopian they may saound, they require that untold power and force be cnetralized onto a relative few individuals in order to accomplish them. The results of that concentration of power have been clear. Power corrupts, absolute power corrupts absolutely. We cannot...we MUST not...allow this nation to continue down this path. Our nation was founded upon principles and ideals expressely formulated to avoid such concentraitions of power and the infliction of such ideals by a few immensely powerful individuals and organizations on the whole. Despite the success of these prgressives and socialists in implementing Alinsky's ideals and goals, yet there are several things remaining within these United States ...in rich abundance...that can be used to stop, roll back, and defeat this struggle for the heart, sould, and future of our nation. Faith in God - There are still, despite all efforts to the contrary, scores of millions of Americans who retain a strong faith in God. The same God to whom our forefathers looked to create and maintain this Republic. Which has been, despite wahtever failings, the strongest force for good in the world, and the modern source for the spread of Christian faith and priniple throughout the world. As PAtrik Henry said, "There is a just God who watches over the destinies of nations. He will raise up frineds to support us." We must hold onto our faith, and rely on God and His teaching...and turn to Him in a manner similar to the teachings of II Chron 7:14. Our Constitution - Our constitution was writtne in easily understood terms. It has been wrested by those who have sough and continue to seek power and control in manners wholly at odds with the principles and words rritten within that document. American citizens should rad and understand the Constitution and demand that their unalienable rights, aas enumerated in that doument, which includes the Bill of Roghts, not only be honored, but be held sacrosanct, irrespective of any individual's or fgroup's thoughts to the contrary. Every public servant in this land, from our military forces, to our public officials (elected and appointed) takes an oath to defend that Constitution from all enemies, foreign and domestic. more over, they take an oath to bear true faith and allegiance to the constitution. We have vast numbers of elected and appointed officials who are violating their oath and who should be removed from office. Our families - The families of a nation reflect the heart, soul...and strength of the nation. A family consists of a father, a mother, and their children. If one or the other, or both, of the parents are in some way lost either by premature death. or illegal behavior, or abuse, resulting in divorce or breakdown of the family, then the extended family of gramndparents, Aunts UNlces, etc. should fill the gap utlizing the faith and moral values resulting from our frst strenght as a nation, listed above. Beyond that, the individual's church and church family should be available. The government was noever equipped, and is not now equipped to be the virtual or default parent or leader of America's families. The family itself, the extended family, and the faith based family should all come into play before a call to the government is made for leadership of America's homes. When American families are based on traditional monagamous relationships, couched in the Judaeo-Christian faith, America's families are strong, America's rising generations are strong, and America itself remains strong. When these values and underlying fundamental principles are stripped away (as Saul Alinsky calls for) America is terrible weakend, which nis Alinsky's point and desire. but America still has tens of millions of strong families and they are the underlying foundation for her revival. Our personal firearms - Again, despite all efforts to the contrary, the American people remain armed. Ideologs and leaders like Alinsky and the progressives and far left who embrace their teachings, fear a well armed populace.We must not give them up. Andy leader who does not trust its common citizens to be armed are not themselves worthy of any public trust. In fact, just the opposite, they should be scorned and kept from any position of public trust or office. Our mottos in this regard should forever remain..."Don't tread on me," and "Come and take them!" The same mottos our forefathers relied upon. Our natural resources - The United States, despite regulations, intiatives, Acts, and Orders to the contrary, is still the most richly blessed nation on earth in terms of overall natural resources. Our overall energy reserves in terms of natural gais, coal, oil, and abundant renweable sources like hyrdro, geothermal, and solar. We have the most fertile soil in rich abundance, we have great forestry reserves that are themselves renewable, we have tremdnous deposits of ores and rare eacrth minearls. We have but to use them and throw off the over regulation and downright brazen attempts to bottle up and lock away our access to these resources and make us dependant on others for that which we have in rich abundance ourselves. Our education - The United States has historically led the world in education. This has been true in primary, secondary, and advanced education. The entire world has sought to come to these shores to obtain the education and research available here. Over the last 40+ years, we have turned our education system more and more towards social engineering via the Alinsky methodologies and goals, and away from actual learniong and real research on issue svital to our progress towards and maintenance of our national interestes, free market, and the sciences. We need to divorce ourselves from the socail engineering and the absolute monopoly and control full government education represent, and return to a free-market based system where the true stake holders...the parents and guaridans of the choildren of this nation have the deciding vote and infgluence in how their children are educated and who can turn to multiple options which can represent the best possible education for the children and youth of this nation...bi it by local school districts, charter schools, private schools or home education, which then prepares them for advanced education in colleges and universities, be they state or privately run. If these six areas are exploited towards the traditional American way of life; if the American people insist upon and elect leaders who govern with these principles in mind, towards a limited Fedseral government that enables these resources and traits rather than seeking to regulate and control them...or, as the current administration seeks to undermine, destroy, and fundamentally change them...then America can become strong again. It is up to us. For the sake of our own posterity...and for the sake of innumerable souls throughout the world who continue to hold true liberty up as an ideal and look to Amerca as the source and inspiration for it...we must persevere, never falter, never waiver, and defend what has been passed onto to us by the sacrifices of so many who have gone before, and win out victorious over these forces that confront us!